top-ranked MMA fighters - even kids and families. Our clean, top-of-the-line facility is family-friendly and welcoming to anyone, no matter your skill and fitness level. As the winner of the 2015 Best of the Beaches MMA Award, 2015 Submission of the Year Award and others, we have the best training facilities in the state, not to mention the only dedicated MMA gym in Jacksonville. Our coaches are top pros with the ability to push you to improve while keeping each class safe, interesting, and fun. Our students join Ludus for many different reasons. We respect that, which is why we offer a wide variety of classes at every level. 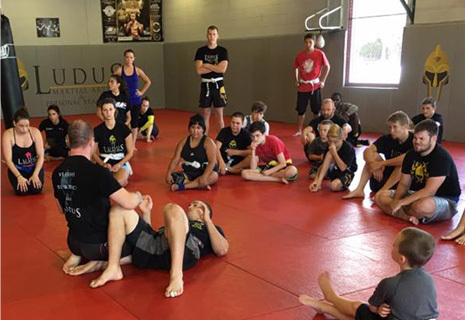 Ludus has tailored MMA classes specifically for you. It can be difficult for adults to find a way to stay in shape that is interesting and fits into a busy life. Ludus MMA offers you a chance to stay fit in a family-friendly environment while challenging yourself in new, exciting ways. Exciting: We offer the widest variety of classes with the maximum calorie burn. Safe: We’ve never had a single serious injury at Ludus MMA and won’t start now. Professional Coaches: Our coaches aren’t just top fighters; not, they’re excellent teachers, so you’ll easily learn top technique. High-Energy: MMA’s a full-body workout. Whether you’ve never done MMA before or you’re a pro, you'll get moving Day 1. MMA's the fastest-growing sport in the world, and kids are begging their parents to try a class. We think starting a kid in martial arts is a great way to get them moving and improve their self-esteem. Confidence-building: Your child's social skills, school perfomance, and confidence transform when they discover new abilities. Safe: We've never had a single serious injury at Ludus because safefy is our #1 priority, especially for our kids. Quality Supervision: We always have 6 or 7 qualified coaches supervising each class, rather than 1 or 2 coaches at most gyms. Fun: We know how quickly kids get bored of the same stuff, so each class is unique. Classes include all martial arts, not just Jiu Jutsu masquerading as MMA like most gyms. If your are looking to become a champion MMA fighter, Ludus can help you get there, whether you are just starting out as an amateur or an MMA professional fighter. The Best Coaches: Ludus MMA is one of the only gyms with specialty pro coaches in every area, so you'll be prepped for it all. Top-of-the-Line Facilities: Get access to quality training equipment whenever you want, not just during classes. Lots of Opportunities for Sponsorship and Promotion: Ludus MMA's strong reputation for winning means our fighters have once-in-a-lifetime opportunities for sponsorship and promotion. Chances to Compete with the Best Fighters: Train with some of the top fighters in the state. We even have connections all the way up to the UFC.